Posted byPaul	 August 8, 2013 August 8, 2013 Leave a comment on Happiness is a rejected manuscript. This might just look like an ordinary rejection to the untrained eye but it outright thrilled me, and while I wasn’t able to take it all in at that moment, I found myself thinking it over in the shower this morning as I tried to wash the fur from my tongue and the beer sweat from my brow. 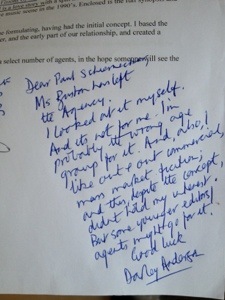 This rejection letter represents the first handwritten response from an agency I have received (excluding the submission of Situation One which took a year to be returned to me). I have read in the Writer’s & Artists Handbook that if you get a handwritten response you’re onto a good thing. Last year each of my submissions was returned with a combination of either a template rejection letter, a photocopy of a rejection letter where someone had crudely scrawled my name in the gap beside ‘Dear’, or worse still, a letter which nobody had bothered to fill the blanks in on. Don’t get me wrong, I understand that running a literary agency is incredibly hard work. They receive so many submissions and any kind of response is taken on board and appreciated. The letter I received yesterday is from Darley Anderson, the actual genuine man himself, proprietor and all-seeing eye of the literary world. While I am ready to admit this may have been as a result of me sending it addressed to someone no longer employed at the agency, I am taking this as a victory. The fact it got as far as Mr Anderson is a small triumph. Having studied the roster of staff in depth there are any number of people who could have written that response to me, or printed the Word document: Rejection Letter To Twerp.doc. Instead he took the time to respond himself, and within a week of receiving my manuscript. This means, at least to my mind, that I escaped the slush pile. It must have been reviewed before it was passed through to him, and I may just be romancing it all but surely those who read it beforehand identified something in it. My cover letter had been seen and under the words ‘50,000 words’ and ‘love story’ a line had been placed, possibly indicating who would be best to field a response. Am I getting too Sherlock here? All I am saying is it’s good to know I am not just throwing my efforts, time, energy, money into a void. There is something on the other end, and it’s hurling stuff back. The Life & Loves Of Jet Tea book launch.